Anyone who has read Nationsmith knows the staff enjoys Spielberg’s 1981 classic, The Raiders of the Lost Ark. 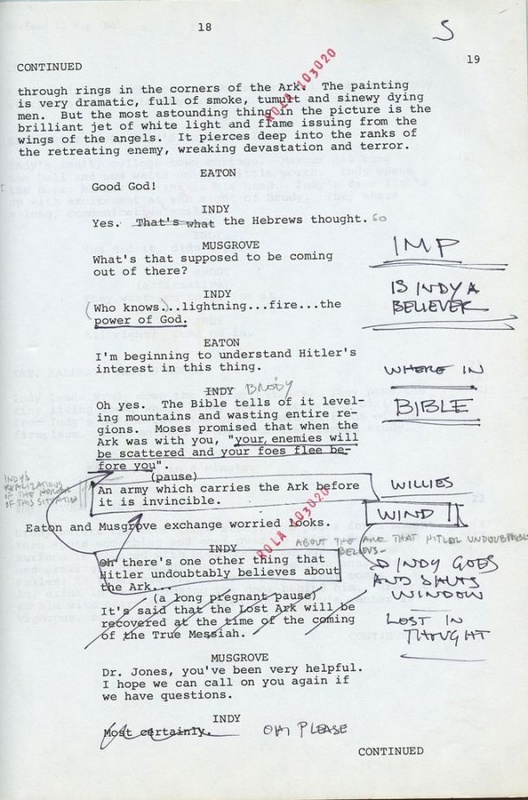 Notwithstanding, our fascination of this classic was heightened further by twelve parasecs (to Kessel, of course) when images of a script with original notes by Harrison Ford surfaced earlier this month. Like many who grew up in the late eighties, I’m still a stickler for The Last Crusade as my favorite in the series, however, Raiders is considered and remains the favorite amongst Indy aficionados. For those disinclined to follow the series, the protagonist Indiana Jones plays two roles: one, the skeptical Archaeology Professor Dr. Henry Jones, Jr. and two, his famous alter ego, Indiana, who is an adventuring, tomb-raiding scoundrel. It is inconceivable for a fan such as myself to see anyone else bring life to this role. In a recent interview, Lucas commented that Burt Reynolds almost landed the role of Dr. Jones, but with the release of Ford’s script, I am comforted by his attention to detail in his creation of Jones. Despite Ford, Spielberg, and Lucas’s last foray into the franchise with the hated sequel to the original trilogy, Kingdom of the Crystal Skull, I remain a believer. But not of the bloody extra-dimensional space aliens. So what is your take on this? Do you believe it’s time for a fifth Indiana Jones movie?